Wow! 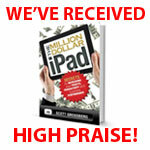 we're really honored to be on Scott's Must-have Checklist and Top 20 Paid Apps list in his new book The Million Dollar iPad: Secrets for Increasing Your Profits, Productivity and Business Performance. You can find a preview of his book here. To remove any hotlink from any of the Signature apps, tap on the hotlink to edit. On the Edit Hotlink page, tap of the icon representing the hotlink, e.g. Facebook etc. You will have a list of hotlink types to choose from. Choose 'none' (the icon with a question mark). When you exit the edit page, the icon will be removed. Note: in the next release, we will put a dedicated button to remove the hotlink. If you switch of the email or footer separator, the settings are not saved properly. Bugfix has been submitted to Apple. We found our first bug! If you upgrade to premium, there should be an Edit and + button at the top of the signature list to allow you to edit/delete a signature or add a new one. These buttons are missing after the upgrade. To restore the buttons, close the app and restart it and the buttons should reappear. In addition to all the great features of Email Signature Pro, Email Signature iPad Edition has the following exclusive Premium features which are available with an in-App purchase. Recently it came to notice via one of our users that if you use an app like iBooks to send an attachment and then paste the signature, the recipient was not able to see the attachment when the email arrives in their email client. And if you can see the attachment, tapping on the attachment doesn't allow you to save it to iBooks but save as image. We have confirmed that this is generic issue with IOS 5.1.1 and not specific to Signature. Attachments showed as images. Here's what we have managed to figure out. We have verified that there is a bug in the latest release of Signature Pro that prevents a user from launching Apple Mail within the app. A fix has been submitted to Apple for approval. Apologies to all our users for the inconvenience. UPDATE: 18 January 2012 - Issue has been resolved. There are no longer any problems uploading images. The server we were using to allow users to upload photos has suffered a severe hardware issue. The ISP has spent the whole day installing new hardware and restoring the software from backups. Note: this situation does not affect any images that were previously uploaded. They are not served from this server. This only affect users who are trying to upload new images. We believe the restore process will probably be finished early morning 18 January 2012. Apple has confirmed that the paste function in Apple Mail has changed. "This is the expected behavior. When pasting into Mail we perform the 2-step paste. The content is pasted by stripping all the attributes that cannot be modified through the rich edit interface and the result is that you see the pasted content without colors, fonts, etc. We preserve only bold, italic and underline. If you want to have the original appearance, after paste you need to press undo.